Our bus stops roughly a kilometer before the border. From this point onward we have to walk. It is raining and it is already dark. Barely visible deep holes on the road are filled with water. Border area after dark is dangerous, but we have to leave Honduras in some way. Perhaps we should have divided the entire travel leg for two days to cross the border during the day. Particularly bearing in mind that the Central American border crossings are typically closed in the evening. Completely soaked we approach the only visible border post. Not a single soul there. A little further we see another booth. This time we see an officer to get our passports stamped. 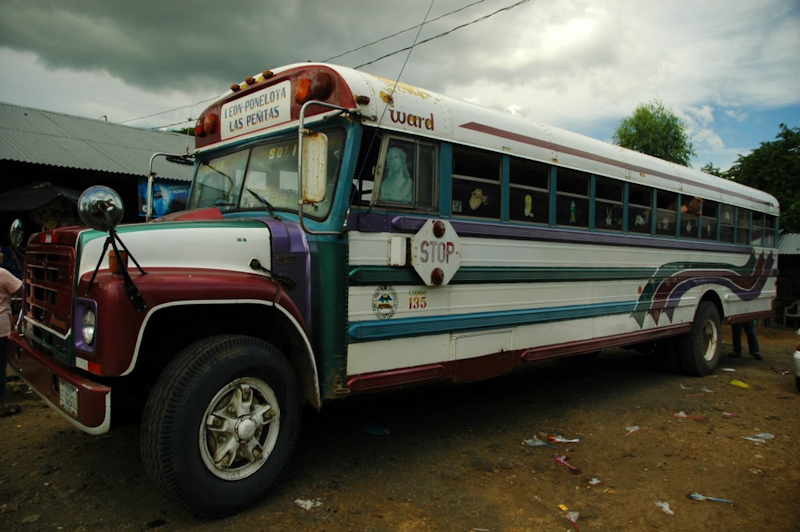 Once in Nicaragua we grab the last bus to the south heading Chinadega. Due to the not uncommon robberies and kidnappings carried out by local criminal groups, travel by night is rather to be avoided. We have no choice. We keep going despite this setting. Fellow travelers, strangers and suspects, empty roads, darkness, heavy rain, sharp and dangerous curves on unlit roads. Some people on the bus doze off and at some point, the vehicle stops. I only hear unintelligible voices coming from outside. I wipe off steamy window to see a man with a rifle in his hand. “No one has an idea what is going on as these folks are sleeping…..Are we in trouble?” – I think to myself. Fortunately, it turns out that the gents outside are a police checkpoint in civil clothing. We smoothly carry on to Leon. No places to sleep. We search every corner of the city just to reach a hole of a place, an isolated hostel in the middle of nowhere. Fortunate enough to be the only guests that night. I see a portrait of John Paul II. It is the only poster hanging on the cracked, pale walls of this lousy establishment. I engage in the conversation with our Spanish-only-speaking host. This gives me the impression how important for the people living in these areas is a religious life. The guy easily recalls the Pope’s dates of his pilgrimage to Nicaragua, to Poland and the date of his death. The following day we go down the stone-paved road. On the distant horizon I see a great volcano overwhelming the city. We eat dinner in a crowded cafeteria in the marketplace, buying a few different species of bananas as a dessert and yet we visit a bakery to get some home-made pastries. We head towards the but station to get on a colorful, long-exploited school bus. In the United States the yellow bus has become out-of-order. Here in Nicaragua it goes under countless repairs and serves its well-deserved long-lasting retirement assignment. Longing for waves we head towards subtropical Pacific coast. We cover the distance of 11 miles in less than half an hour. We find ourselves on a dark, sandy beach. Very hot water and high long-period waves. Perfect conditions for surfing, unfortunately there is not any surfboard rental shop. In fact, it’s nothing here. The entire coastal village is empty. Beach bars seem to be prepared for onslaught of tourists, however we are the only ones within a considerable radius. Over the next few hours the place becomes our private wild beach for fun on the waves. I point out that in such places (non-emergency services, high waves and the coast of an unknown type) you should always pay particular attention to the tide times and the possible presence of a very dangerous rip currents. Granada is slightly smaller than Leon. 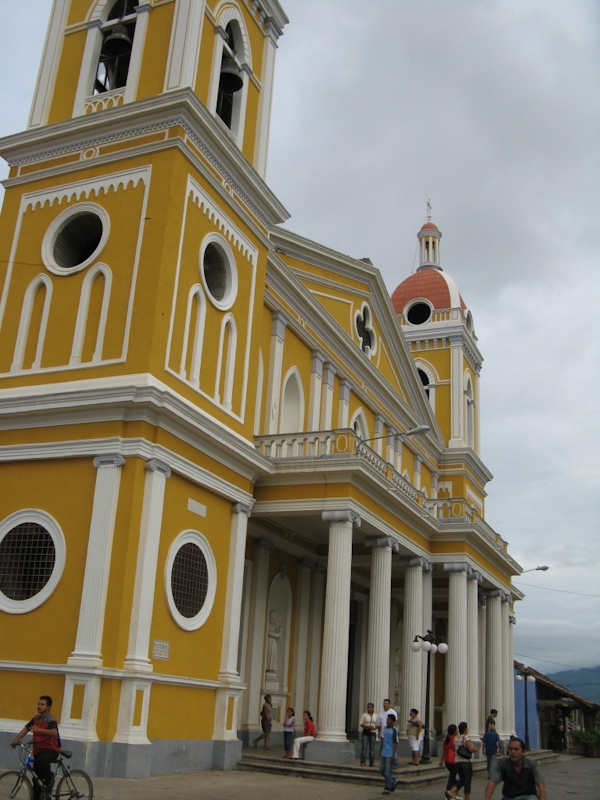 It’s very cozy and welcoming colonial town located just above Lago de Nicaragua, the largest lake in Central America. Lake has even some myths associated with. 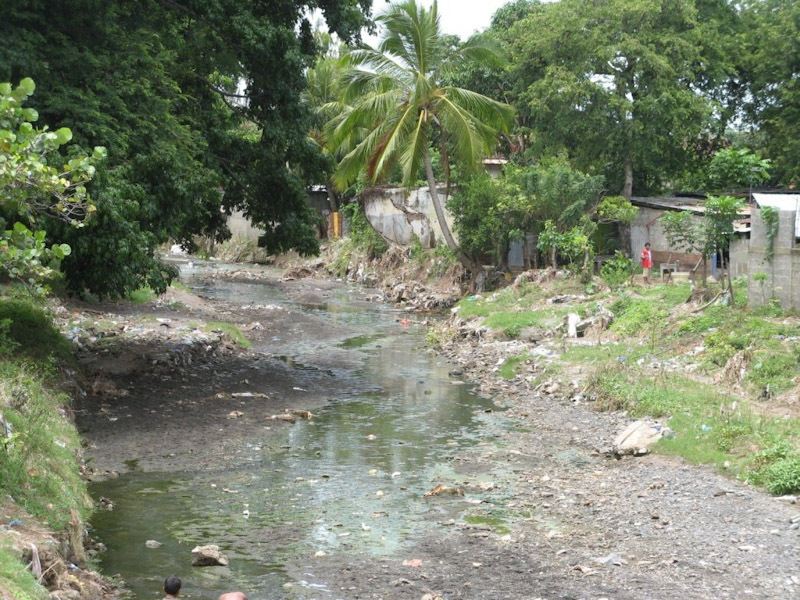 More or less verified, however one of them stipulates that Lago de Nicaragua is the world’s only freshwater sharks habitat. There is a large square in the city of Granada, where most of the city’s cultural life takes place. Frequent performances and numerous events showing local tradition and art. In mid-September we experience the celebrations of Central America’s independence from Spain (15 September 1821). Crucial point is the traditional torch run through the whole of Central America passing right today through Granada. The today’s ceremony consists of drummers performance, school students parade, dancers show, plentiful songs aloud and various street artists showing off their skills. The city is bustling day and night. Celebrations on the square serve as an opportunity for street food vendors to earn extra money. My favorite two dishes are deep-fried crispy chicken with rice wrapped in a tortilla (properly greasy!) and boiled potatoes served with hot salad wrapped in a palm leaf. Volcanoes form craters. One of them is Laguna de Apoyo. We visit the place to see the naturally formed lake inside the crater. This remote place is surrounded by a lush green jungle. On the site we have some equipment available. Drifting board attached to the bottom to plunge into the water. There is lots of swimming, canoeing, carefree diving until an upcoming storm appears on the horizon. Fortunately, the storm lasts just half an hour. We carry on with a blue-lagoon activities. A couple of recent days traveling resulted in making a descent amount of new friends. 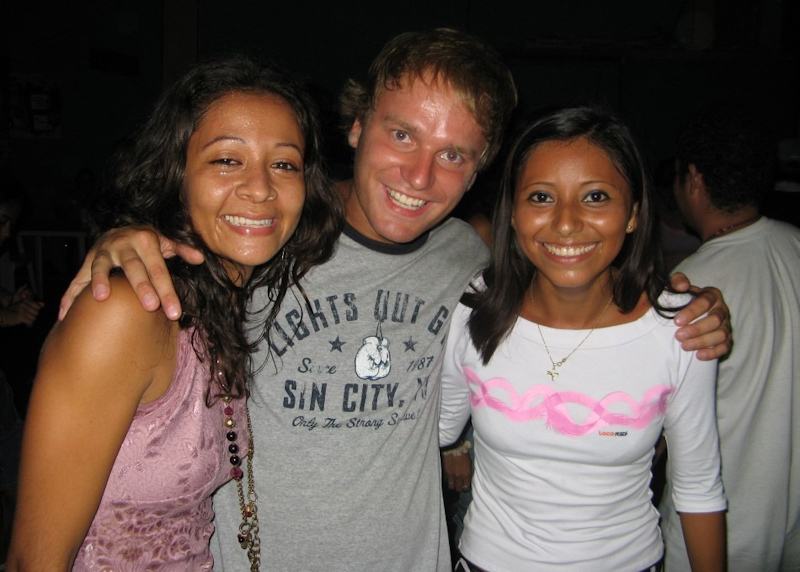 It is easy to meet interesting people, as in Nicaragua being open and outgoing is something pretty natural. Both for travelers from across the globe and friendly inhabitants of Granada. Open round-the-clock bars and groovy rhythms of Latin American music make me loose the sense of time. Probably I should have left this charming place some days ago.